Today, we’d call that “grit,” a concept that has been gaining traction particularly through the work of Angela Lee- Duckworth, a lecturer in psychology at the University of Pennsylvania. She studies the intangible aspects of success: self-moderation, passion and perseverance, and a healthy approach to disappointment. “Grit is having stamina,” says Lee-Duckworth. “Grit is living life like it’s a marathon, not a sprint,” while acknowledging your abilities as well as your weaknesses. Her book, Grit: The Power and Passion of Perseverance, begins with a discussion of students who drop out of West Point, and that “rising to the occasion had almost nothing to do with talent.” The determinant is less ability than it is a “hang-in-there posture toward challenge.” Grit is what, ultimately, will help kids accept setbacks and weather the difficulties they’ll encounter as they grow into adulthood and beyond. “These are really just foundational skills,” says Kate Cassidy, director of Brock Youth University, a program based in St. Catharines, Ontario. “Developing these skills doesn’t start at 18; it starts when they’re much younger.” They are nevertheless what employers will be looking for when the campers have grown, left camp, and begin their careers. “You can really tell in a work environment who has been to camp and who hasn’t,” says Lisa Wilson, long-time director of Camp Oconto. She chuckles as she says that, perhaps out of modest pride for helping girls over her decades as a camp professional, to achieve that difference, that character. Wilson first attended Camp Oconto at just three months of age. Her parents ran the camp and then, after them, she ran it, and has done now for 36 years. When it comes to camping, much like Palm, she’s a lifer. She loves it, not for the office work of course—there’s lots of that, which is handled out of the Unionville office whenever they aren’t at camp—but for what camp can do in the life of a child. “I get wonderful thank-you notes and emails from different people,” she says, turning to one that she recently got from a parent in the UK. It’s about a camper who arrived many years from there, and it says many of the things that these kinds of letters typically do. How camp was so important to her, and to her family. How important the memories continue to be, despite how little of each year, when you really think about it, she was actually at camp. The letter writer describes how camp encouraged her daughter to grow and develop into the person she is today. “It makes me realize how important it is to be a positive role model,” says Wilson. “That’s what keeps me going. It can be challenging, but the positive impact is huge.” What that thank-you note conspicuously lacks, as many do, is any mention of specific skill development, at least in the way we typically think of it. The take home, at the end of the summer and in the years to come, often isn’t what they did at camp, but who camp helped them to become. “So many things at camp just come through by osmosis,” says Wilson. “We’re not teaching them; they’re learning by doing.” As she speaks, she wonders if the point might be even finer than that: you’re not just learning by doing, you’re also learning by simply being there. “All the wonderful activities are great, but they’re very much a vehicle for learning some of the more important things,” including self-awareness, communication skills, problem-solving, and perseverance. For many kids, camp is the only place they not only have an opportunity to really be responsible for carrying their own pack, but are required to, and that’s true across the various types of camp offerings. “It’s not a cruise,” says Christy Griffin of Bytown Brigantine. 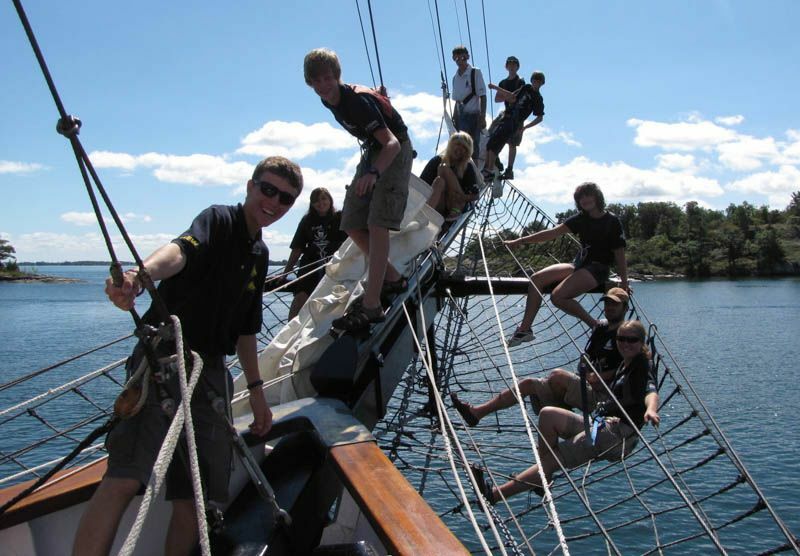 They sail tall ships with fully licensed youth crew on Lake Ontario, the St. Lawrence, and the Atlantic Ocean. “You’re stepping aboard as a crew member,” says Griffin. “It’s fairly rustic. There are no curling irons and no hair dryers. If you want a shower, it’s usually in the lake.” There are lots of things to do, and everyone does them. At the same time, kids learn about weather patterns, do chart work, even prep food in the galley. “It’s very much a hands-on experience.” It also isn’t for the faint of heart. Griffin recalls that one year there was a girl who was terrified of heights, and resistant to getting up into the rigging. Even so, the boat is its own world, with everyone leading by example, and within a few days, she was up there, too, getting the job done and loving it. They all do, even without their phones (devices are only available to the kids while they are in port). One session sails from Saint John, New Brunswick to New York City, and takes in the sights and culture along the way. “They will be sailing Long Island Sound, Martha’s Vineyard, and Mystic Seaport. … In Louisburg, it’s crab fest that weekend, and we’ll be participating in a very authentic maritime event.” In port, the kids are the experts, representing the ship, its crew, and interpreting the experience aboard. For some—as with the girl who was reluctant to climb into the rigging—the physical challenges of life aboard ship are the most consequential. For others, though, it could be the public speaking, or the need to collaborate with others. It’s a reminder that all kids need to be challenged in order to grow and learn, though they don’t all need to be challenged in the same way. It doesn’t always present in the same way. Contrasting with life aboard a tall ship, Lacasse says that “if my kids want to follow ants for an hour, great! That’s an awesome activity!” Watching ants is a great activity, in her mind, not because of what kids learn about ants, but the time it gives them to slow down a bit, follow their curiosity, and support the values inherent in the camp experience. “Our campers will become staff,” says Lacasse, “they have to be empowered in their experience if they’re going to transmit the same thing to others.” Certainly, that experience of empowerment, as well as that sense of trust and responsibility, can be transformative. “These are great kids!” says Lacasse, and she lets them see that about themselves. “We want them to be in contact with the world, with each other. When I talk to parents, I talk about how they will develop at camp, not what they’re going to do at camp. It highlights what a different place, a different sense of priorities, can bring out in kids. True, most parents don’t have to enforce a no singing rule. In the general course of events, sadly, kids aren’t given to spontaneous, full-throated singing. They feel their voices aren’t good enough, or are embarrassed for others to hear. But again, camp is different. At Oconto, the girls break out into chants and songs in the dining hall and everywhere else, too. It’s probably because it’s just one of those things that people do at camp, and always have. And everyone does it, so no one is the odd one out. Given that Oconto is a girls’ camp, there isn’t the sense of being watched by boys. It’s a different set of parameters that the campers, for a week or two, are living within. It might not seem like much, given that most of the campers’ lives are spent elsewhere. But that’s deceptive. For the girls canoeing at Oconto, the kids watching the ants at Portneuf, or the kids in the rigging of a tall ship, they’re learning about who they are, what they’re capable of, and who they might become. They’re learning about the world, the values that they hold, and the opportunities that are available to them. They’re learning to trust themselves, and to trust others. “If you build up skills that are positive,” says Lacasse, “that’s awesome.” She’s right. It is. And they’re skills that they’ll rely on for the rest of their lives.